Maya and her friends from coding club have an exciting new project: they're coding lights and music for the winter dance! 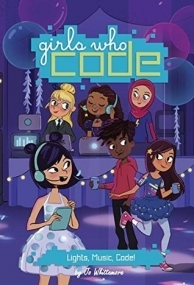 But when Maya's old troublemaking friend Nicole moves to town, Maya starts spending a lot of time with her, and less time with her coding friends. Nicole just gets her in a way that her other friends don't. Will Maya get swayed by Nicole's wayward ways, or will she stay true to her "permanent group" from coding club? And will she come through on her part for the light and music coding project? Maybe coding--like friendship--is about being there for your friends when they need you the most. Maya and the coding club are going to be working on a new and innovative idea for incorporating technology into the school dance, and are having trouble coming up with ideas and with implementing them. (Programmable bracelets would be great, but who has the money?). Not only that, but when they do settle on an idea, it requires a lot of work, and Maya has spread herself very thin. It doesn't help that Maddie, the friend who got her in trouble for shoplifting, is moving to town and wants to hang out with her. Maya's parents do NOT approve, but it's hard to shake Maddie, even after she says and does some things that should warn Maya that she hasn't really changed. Soon, the club has a plan, and Maya is working hard on her part of it, but when she finds out that Sophia doesn't have a nice dress to wear, she's bound and determined to help her friend out with a spectacular outfit to help her catch a certain boy's eye. Will she be able to finish it in time? The ensemble cast if nicely diverse, and it's fairly easy to keep the characters straight. Maya's sister is a great addition, and it's nice for younger students to see older girls they can admire and ask for assistance. The fun illustrations scattered throughout the book also make it easier to identify the characters, and add a fun facet that might help attract readers to the books... and help make them coders! There are very few books of any kind that include coding as a key plot element-- Gene Luen Yang's Secret Coders is the only one that comes to mind. There are a lot of books that include groups of girls doing projects, so Girls Who Code will be popular with readers who like Simon's The Cupcake Club, Kimmel's Forever Four, or Singleton's The Curious Cat Spy Club.